I cannot believe I haven’t written about Michaelangelo’s. Off the beaten track on Murray Hill Road, this hidden gem is worth raving about. 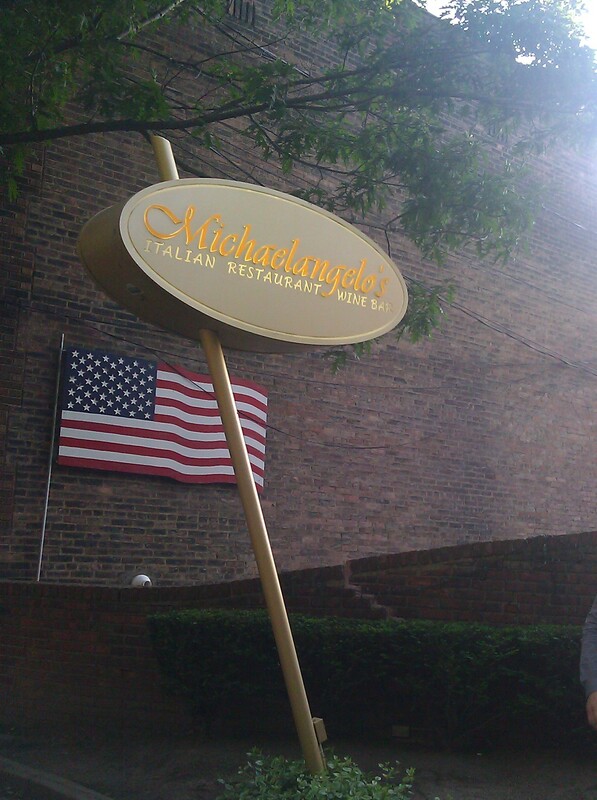 It is without a doubt my favorite restaurant in Little Italy – hands down! Since it is off the main drag and tucked away behind a brick wall, the atmosphere is more subdued, and they have a large parking lot. This is not your spaghetti and meatballs and gnocchi kind of Italian restaurant. Whenever anyone asks me what to order here my answer is the arugula salad with limoncello reduction (Insalata di Rucola con Limoncello) and the Sacchetti al Tartufo. My father teases me about being so passionate about a salad, but it is THAT GOOD. And OMG, the sacchetti! But I am getting ahead of myself. The starters are divine. 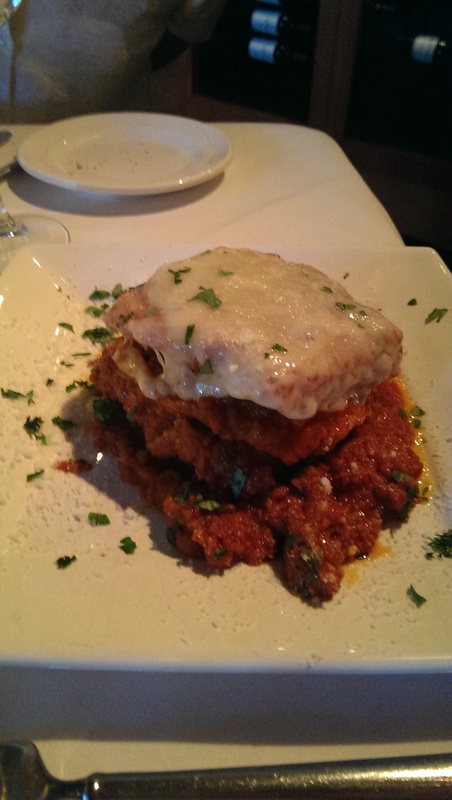 On a recent trip my friend ordered the layered eggplant terrine (Terrina di Melanzane), and it turned out to be the most delightful eggplant parmesan and was surprisingly large. I will be ordering this the next time I go! I ordered the caprese salad, which featured hunks of fresh mozzarella and tomato (they were still in season at the time) and was topped with fresh basil and just some olive oil, salt and pepper. OK, onto the pasta. The pasta here is all handmade and perfectly prepared. You can order half portions of the pasta, and I suggest you do to try several at once. The aforementioned Sacchetti al Tartufo are little pillows of heaven stuffed with ricotta and black truffle and served in a black truffle cream sauce. Words cannot do this dish justice. You simply must order it. I was hooked from the first bite. Vegetarians will be happy with the potato gnocchi with hazelnut pesto (Gnocchi con Pesto di Nocciola) and the ricotta cavatelli with wild mushrooms in a rosemary fontina cream sauce (Cavatelli con Funghi e Fontina). I personally am also a huge fan of the veal-stuffed tortellini with prosciutto di Parma, green peas and Parmesan Reggiano (Tortellini di Vitello con Prosciutto e Piselli) – not pictured. I got hooked on this particular pasta dish while living in Germany, and their version is delicious. The Pappardelle alla Bolognese (also not pictured) is also savory and delicious. I got to try it on the NEO Food Tour of Little Italy. 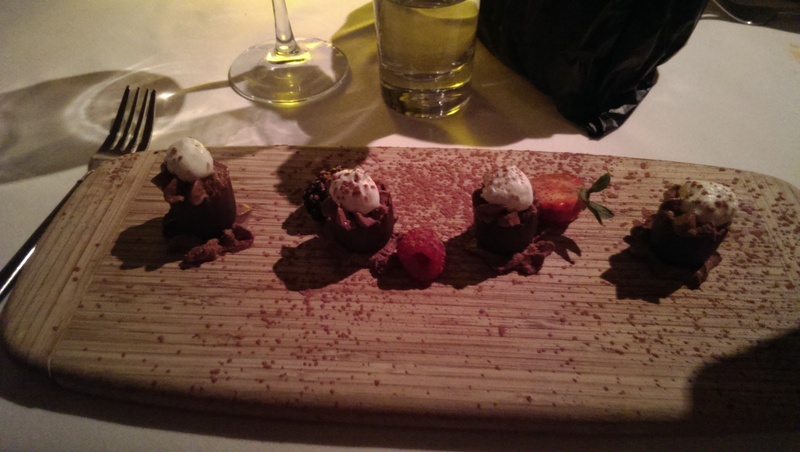 The desserts also do not disappoint. The tiramisu was fresh and creamy with just a hint of espresso and cocoa, and I seem to order the chocolate mousse cups every single time I go. They are four individual morsels of light and fluffy mousse in chocolate cups that are easy to pop in your mouth and savor. This place – particularly the bar – is also extremely inviting in the winter, because it has a roaring fireplace. It is just tough to get one of the easy chairs in front of the fire because they are so popular.